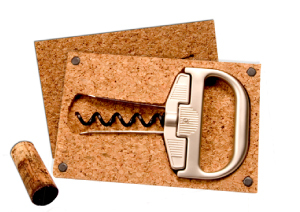 Removing an old and brittle cork can be a frustrating work as it tends to crumble and break into pieces. In the past this was something I accepted and found my decanting funnel with a net useful for stopping pieces of cork joining the wine in the decanter. This now seems to be a thing of the past. I recently received a most useful gadget to try out – “The Durand”. This consists of two components – a thin helix similar to that of a “Screwpull” which you first insert in the usual manner. The second component is a two-pronged part similar to the so called “Ah-So” or “Butlers friend”. You slide this in between the cork and the bottle. As you twist this, the cork loosens from the wall of the bottle so that one can pull the cork carefully out in one piece. I have had the opportunity to try it during the last six months, amongst others at a 30 vintage vertical tasting of Château Haut Brion, going back to 1937, at a 40 vintages tasting of Château Margaux back to 1926. It performed beautifully and I can warmly recommend this useful tool for lovers of mature wines. This is a great idea for a Christmas present and comes in an attractive presentation box. I was given a Durand last week as a wedding gift and now I am completely sold on its ability. In addition to numerous bottles of vintage Riojas, we also opened an ’85 Mazis-Chambertin and an ’81 La Ladonne with ease. The corks came out perfectly when they most likely would’ve cracked/crumbled with a regular waiter’s corkscrew (or shoved in with a regular ah-so).